HOUSTON (CN) – Police said Friday that a man suspected of killing George H.W. Bush’s former doctor to avenge his mother’s death on an operating table 20 years ago killed himself as police converged on him. “The suspect is deceased. He committed suicide when he was confronted by two members of the Houston Police Department,” Houston Police Chief Art Acevedo said in a news conference at the scene Friday. Houston police said earlier this week they had identified Joseph James Pappas, 62, a Houston realtor and former law enforcement officer, from surveillance footage as Pappas rode past Dr. Mark Hausknecht – both men were riding bicycles – on the morning of July 20 in the Texas Medical Center, Houston’s bustling hospital complex. Hausknecht’s wife said police told her that her husband was found that morning in a noisy construction site, which masked the sound of three gunshots Pappas had fired at him from his bicycle. He was pronounced dead at a hospital. Acevedo said at around 9:30 a.m. Friday an employee of the Houston Parks Board making his regular rounds looking for vandals who spray graffiti near Brays Bayou in southwest Houston called 911 and said he saw Pappas sitting near the bayou. Acevedo said the caller jumped a curb in his vehicle and drove up to Pappas and Pappas walked away. A policeman caught up to Pappas on a street a short distance from the bayou, positioned his cruiser in front of him and ordered him to the ground. Pappas, who was wearing body armor, shot himself in the head. Though police did not identify any suspects in the days after the shooting, they said they believed Hausknecht had been targeted. Acevedo identified Pappas as the suspect at a news conference Wednesday and revealed a possible motive: Pappas’ mother died on Hausknecht’s operating room table in the 1990s. Acevedo said police searched Pappas’ home early Wednesday morning and found several guns, and that Pappas had extensive law enforcement training, most recently in August 2017. Acevedo told reporters Friday that police had discovered an extensive file that Pappas had compiled about Hausknecht’s residence, his vehicles and the hospital where he worked. Pappas worked as a deputy constable and reserve deputy constable in Harris County, whose seat is Houston, from 1983 to 2013, according to KTRK, Houston’s ABC affiliate. Acevedo said Wednesday that Pappas had not been seen for several days, and that the last contact anyone had with him was a text message he sent Tuesday morning saying he was going to kill himself. Shortly after the murder, Pappas reportedly posted for sale on an auction website two firearms, two bulletproof vests and two bulletproof door panels for a Crown Victoria, a vehicle commonly used as a police cruiser. Houston police declined to say if they believe Pappas shot Hausknecht with the listed firearms. Pappas owned Pappas Realty Company in Houston and his realtor license expires on Sept. 30 this year, according to the Houston Association of Realtors. A phone call to his office Thursday went straight to voicemail. Acevedo said Friday that police were monitoring Pappas’ electronic key, which realtors use to enter homes for sale, and that Pappas had entered four homes since the manhunt started. “We checked all those houses,” Acevedo said as police helicopters buzzed overhead. Hausknecht’s family said in his obituary that he had been a practicing cardiologist at the Texas Medical Center since 1987. “Mark was driven by insatiable intellectual curiosity but found relaxation through physical labor. He was a voracious reader, pilot, chef, DIY repairman, beekeeper, recycler, urban gardener, cyclist and lover of music and the arts,” the obituary states. 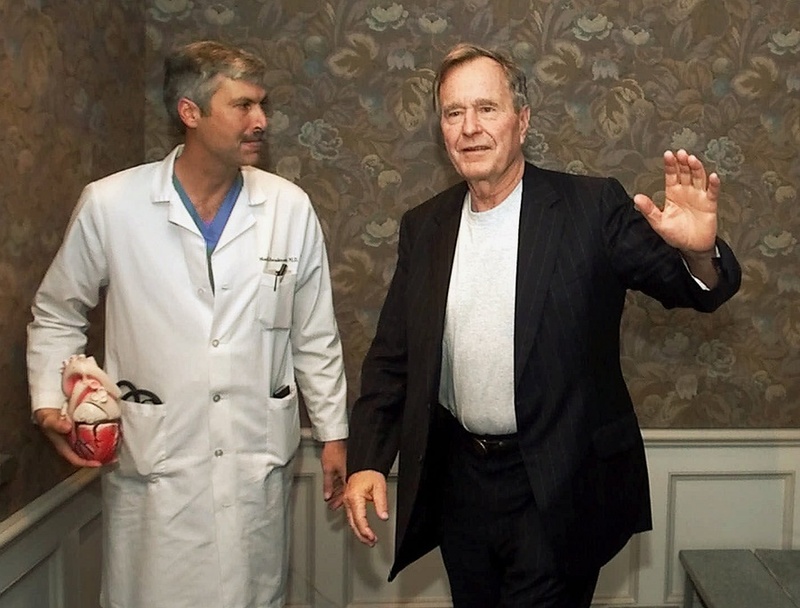 His most famous patient, former President George H.W. Bush, called him a “fantastic cardiologist and a good man” in a statement. “I will always be grateful for his exceptional, compassionate care,” Bush said.